Stretch your dollars farther with the Rockin' Jump 30 Day Pass! 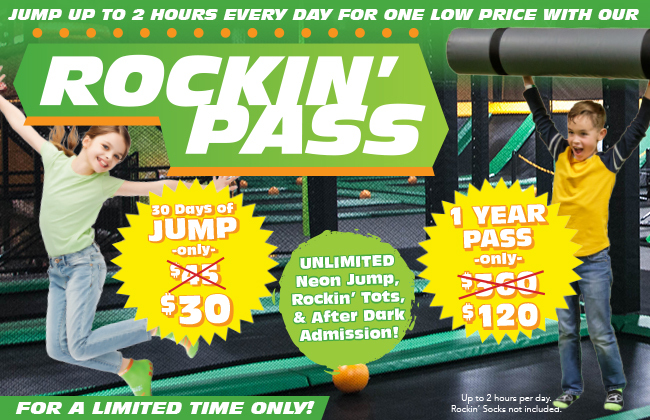 Give the Gift of PLAY & ACTIVITY with the Rockin' Jump Annual Pass! Buy now and save up to 67% on these Passes! Perfect Plan for an ACTIVE kid for Spring Break! Do you know that kiddo that is ALWAYS moving? Do they LOVE to jump, skip, leap, fly, climb and swing! They will LOVE a Pass to Rockin' Jump! Imagine never paying admissoin at Rockin' Jump again - just walk in and start playing! For the cost of just 2 visits, you can purchase a 30 Day Pass! For the cost of just 6 visits, you can purchase an entire YEAR Pass! These Passes can also be used at Neon Jump Night, After Dark or Rockin' Tots - No Limits! At Rockin' Jump, the main floor of the facility is covered with wall-to-wall trampolines, but they aren't only for fun... Visitors of all ages are encouraged to bounce as a means of exercise, too. Beyond just proving Newton wrong, jumpers can enjoy anti-gravity activities such as cannonballing into the stunt-bag area, jousting with competitors on the gladiator-style X-Beam, or pulling down rebounds off the Rockin' Dunk backboard. Stuntbag, dodgeball, and basketball are also available, and the facility hosts a teen night on Fridays and a family night on Saturdays. For those who prefer to earn extra elevation through hard work, the Vertical Ops Rock Wall features a 3-story, climbing wall, a much more rewarding way to reach new heights than simply hitchhiking onto a hot-air balloon.